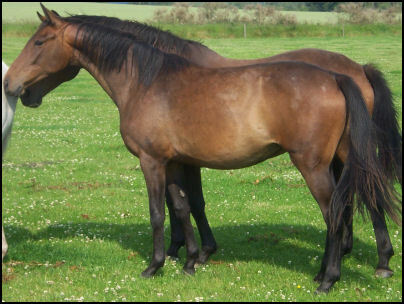 Harmony Dawn is a pretty 16hh Thoroughbred mare bred for racing, bought from the sales who subsequently showjumped to Grade A level. 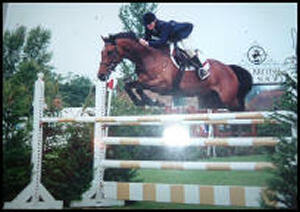 She was placed in the Grade C final at Hickstead and won many highly competitive Amateur classes. Her Sire Rolfe was initially a teaser and never strongly patronised. He still sired over 100 winners on the Flat and National Hunt, including Mighty Flutter, famous hurdler Lady Rebecca, General Wolfe, Flyers Nap and prolific Point to Point winner Dun Gay Lass. Her Dam was by Celtic Cone sire of Grand National winner Earth Summit, Champion Hurdle winner Celtic Shot and chaser Go Ballistic amongst others. 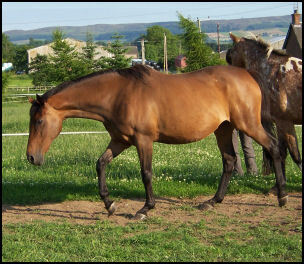 Harmony Dawn has had one foal to date for us, a lovely filly Blacklaw Xing Xing, who was a surviving twin.